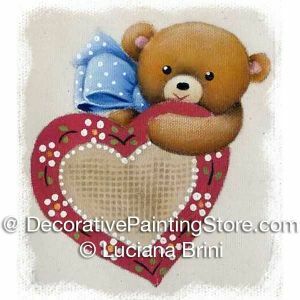 Teddy and heart painted on fabric surface of your choice. Perfect for the pocket of a t-shirt or denim shirt. DecoArt So Soft Fabric Paints or you can substitute DecoArt Americana acrylic paints mixed with DecoArt Fabric Medium. Pattern includes photo,step-by-step instructions, pattern to trace.